Some drinks don't taste the same without a salt-coated rim on the glass, or sugar for that matter. Be sure to try our bar glass rimmer for all of your special cocktail needs. Our rimmers are durable and are available in 2 tier or 3 tier displays. Serve picture perfect Margaritas, Bloody Marys and Gimlets with this three-compartment glass rimmer. 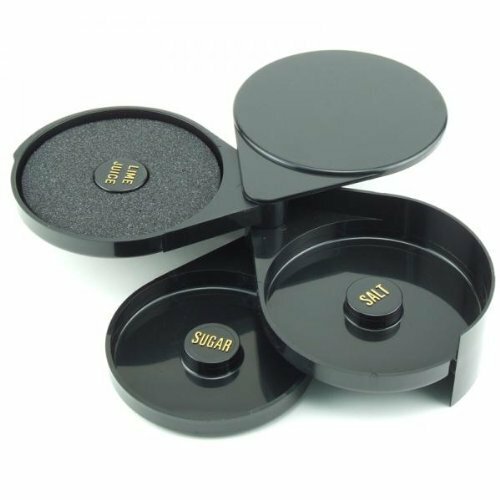 The perfect salt or sugar-rimmed glass is easier than ever thanks to this convenient system. Clearly labeled trays hold your salt and sugar and there's even a sponge for water to make Them stick! Easy to use, simple to store, and quick to clean, it's every bartender's best friend! Folds for easy storage. Great for Margaritas, Bloody Marys and Gimlets. Labeled trays to avoid cross contamination. Three tier Shifting compartment trays Folds for functionality and easy storage. Made from durable plastic construction. Black color matches any decor. If you have any questions about this product by Chef World, contact us by completing and submitting the form below. If you are looking for a specif part number, please include it with your message.